The season for fresh peas is short, as they are only grown and harvested in spring when the weather is cool. If you want to capitalize on the fleeting period for fresh peas, seek them out at your local market now. 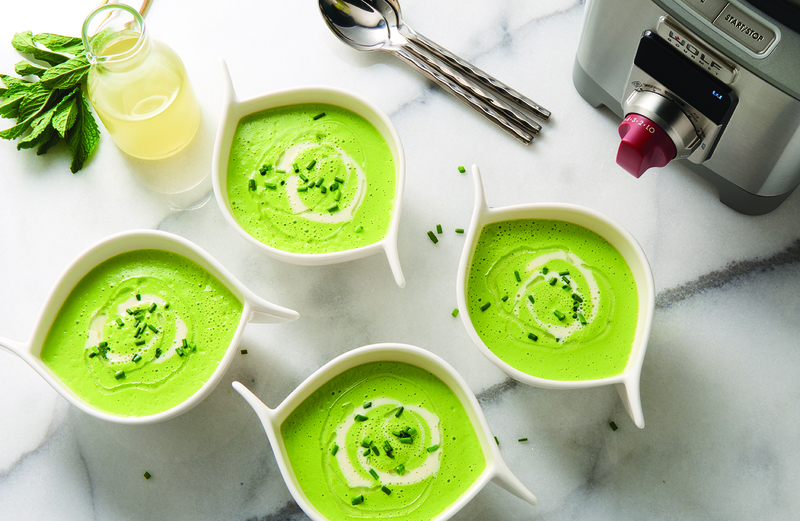 We combine the grassy freshness of fresh peas with aromatics and fresh mint to create a soup capturing the taste of spring. 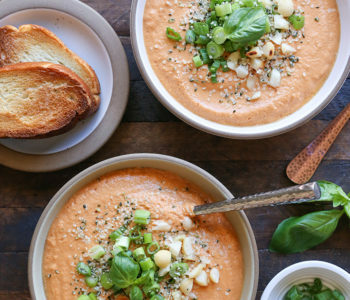 You’ll need about two pounds of fresh peas for this recipe. To shell them, snap off the stem end of the pod, and pull the string along the inner seam of the pod. Press the seam of the pod and pop it open. Run your finger down the pod to pushing out the peas. 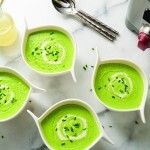 Once the aromatics are sautéed, the soup comes together very quickly in the blender. 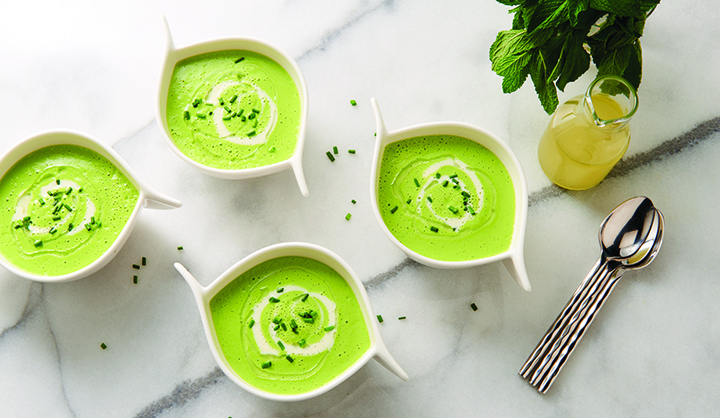 Garnish with crème fraîche and chives, and add an extra layer of complexity with a drizzle of mint oil. Make the mint oil: in a small saucepan over medium, heat the oil. Break up the mint sprigs and add to the saucepan. Heat until mint is fragrant, 10 to 15 minutes. Remove from heat and strain the mint leaves. Transfer oil to a squeeze bottle. Make the soup: in a large skillet over medium heat, melt the butter. When butter is bubbling, add leeks, garlic and 1/4 teaspoon salt. Cook until leeks and garlic have softened, 10 to 12 minutes. 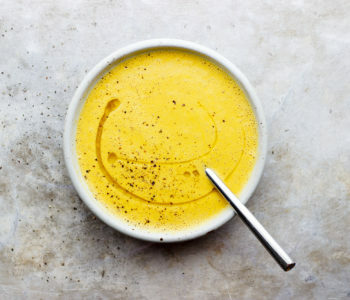 Add remaining soup ingredients except lemon juice to the blender in the order listed. Add leek and garlic mixture. Select the SOUP setting and press start. Once the cycle finishes, add lemon juice and PULSE several times to combine. 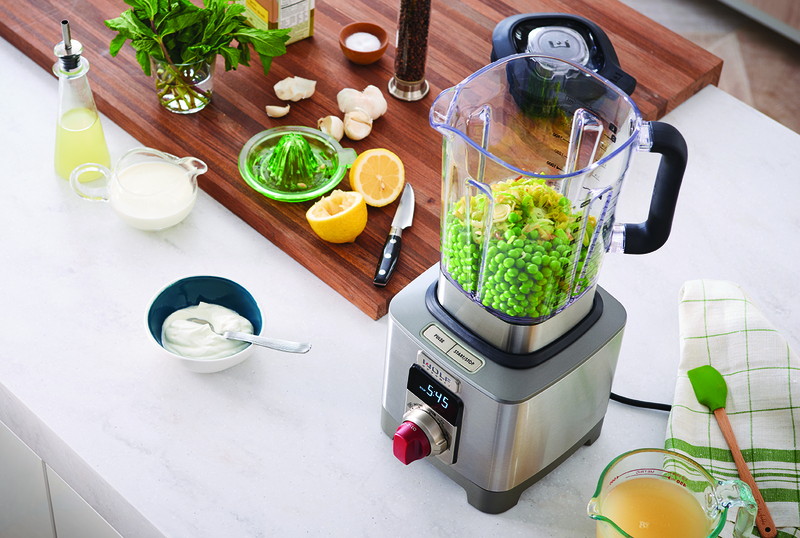 Whatever your taste, the Wolf Gourmet high performance blender will craft what you crave. 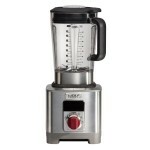 It offers complete control for complex recipes and pre-programmed settings for one touch smoothies and soups. Infinite speed control and quiet design are just the beginning.